With looming ecological crises and an ever increasing human footprint across the globe, many studies have looked at how communities try to maintain a balance between sustenance and ecology. An unlikely source of ecological insight is religion. Eliza Kent’s book looks across Tamil Nadu, India, to understand the phenomenon of sacred groves – small forests or trees set aside for a deity’s exclusive use. Sacred groves across India have fascinated many for obvious reasons. In a period when environmental degradation and destruction is the norm, their mere presence, apart from the botanical variety they offer, in densely populated areas can be a source of hope and interest. Religious taboos have played a distinct role in villagers not using these groves in spite of having urgent requirements. 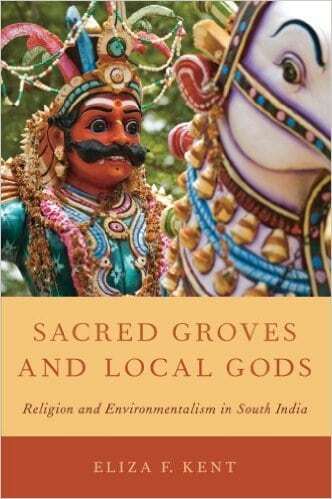 Kent shows how the origins of beliefs related to sacred groves lie in the 18th century Tamil country rather than having ancient origins. Travelling and conversing with villagers across Tamil Nadu, Kent looks at how the sacred groves with linkages to village based Hinduism fare alongside environmental initiatives (CPREEC), governmental control and changing lifestyles. Complementing Kent’s perceptive comments and analytical abilities are the conversations that dot the book. Throughout, she lets the voices of the villagers she converses with sail through, without obstructing them. The remoteness of the places travelled to alongside the photographs in different timeframes (in the early 2000s) also read as an ecological picture of a land that is in rapid change. travelled to alongside the photographs in different timeframes (in the early 2000s) also read as an ecological picture of a land that is in rapid change. Kent maps the connections between written and everyday practices that influence the lives, groves and histories of these communities and places them in the context of modern Tamil Nadu and environmental politics. What emerges is an endearing portrait of attitudes, mythological accounts of temples (sthalapuranas), and histories of communal identities alongside that of the sacred groves. The deities these sacred groves house are fierce and act as guardians (Karuppaswami-the “dark god’’) for the villagers. They also possess an ambiguity by invoking fear as well as gratitude among the villagers. Though the deities of these groves are located outside the settled everyday life of villagers as in Madurai and Tiruvannamalai, they nevertheless are linked to the political and social dynamics of the villages. Deities like Mariamman and Kaliamman protect the boundaries as well as the residents from strife and disease. One of the engrossing chapters looks at the ambivalence of roads, which are routinely depicted as agents of environmental destruction. Roads for many of these communities symbolize progress and a chance to connect with modern lifestyles. But they can also bring about a change in how these deities are perceived and worshipped, thus impacting how the sacred groves are seen and approached. They can considerably weaken the longstanding taboos on the usage of the groves as shown at Attipati. Previously, many villagers avoided these groves due to the dread of dangerous predators and for the fear of causing pollution, ‘tittu’ to the deities. With significant changes in conceiving as well as approaching space with the development of roads, these practices are seen as illogical by many youngsters. Thus, what was previously believed to house a fierce deity becomes property that is in the control of the temple which requires proper management. The book also throws light on a familiar theme in environmental politics in India wherein a top-down approach under the garb of ‘social forestry’ leads to governmental control, leading to the plantation of economically feasible species, thereby reducing the incentive for the protection of the groves for the villagers.In an interesting as well as a revealing chapter on CPREEC (CPR Environmental Education Centre) in Chennai, Kent throws light on its ‘evangelical religious environmentalism’ whereby it seeks to ‘civilize’ the religious practices of the communities in areas where it has taken up the restoration of sacred groves. Sacred groves in Tamil Nadu are dedicated to deities worshipped by non-Brahmin castes and routinely involve animal sacrifices. The Brahmin-origin CPREEC brought various bans against animal sacrifice among the communities, but they decidedly fell flat. In vigorously supporting a ban on animal sacrifice, CPREEC, while seeking to understand the taboos against felling of trees and destruction of groves, denied the same understanding to rituals and sacrifices that play a vital role for the villagers in cementing the bond between them and the deities who are mostly non-vegetarian. Influential writers such as Madhav Gadgil showed that it was the primitive belief system that helped the groves remained sacred. It was suggested that once this primitive religiosity disappeared to make way for organized religion such as Brahmanical Hinduism, it would lead to the destruction of the groves. Loss of fear and faith are also seen as primary reasons in the gradual chipping away of the taboos against the usage of sacred groves. However, Kent shows that the stronger the community solidarity, the easier it becomes for the villagers to impose sanctions on degradation or usage of the groves as evident at Urani. Likewise, as groves slip from the control of temple associations and village leaders of cohesive communities and attain devotees from distant areas, they tend to decrease as seen at Puttupattu. Whatever be the raging debates on the utility and use of the sacred groves, the book throws light not just on the ecological value of these groves but also their relation to village-based Hinduism, which plays a prominent role. And most importantly, it also brings into focus how the villagers themselves feel about the sacred groves and their ecological habitat. At times, one feels that the book is filled with details that the author could have done away with. But, that would qualify as a minor quibble in a book that is thoroughly researched and beautifully written and one that is more than welcome in an area that is gradually gaining prominence. Nagothu Naresh Kumar is a Graduate student at Central European University, Budapest.